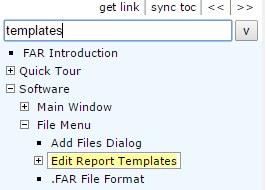 FAR HTML version 5.7 and later contains a filter/search text box above the TOC (Table of Contents) tree control. As you type words, matching TOC items are highlighted. 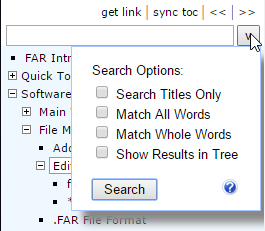 To perform a full text search (if configured) drop down the search pane and click 'Search' or hit CTRL+ENTER. When performing a full search use keywords 'AND', 'OR' and 'NOT' just as with HTML Help (.chm). The default search is an 'OR' search -- eg. Search for "tree dog cat" will find all documents containing either 'tree' or 'dog' or 'cat'. 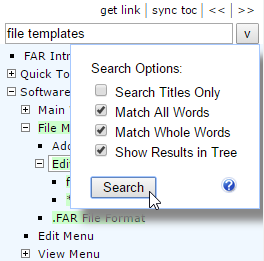 Check "Match All Words" to default to 'AND' search -- ie. 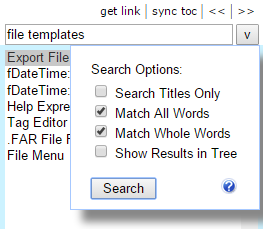 find docs that contain all words 'tree', 'dog' and 'cat'. Use the AND or OR prefix to override the default search type. eg, "tree AND dog OR cat". Use the NOT prefix to exclude word matches. eg. 'tree NOT cat' -- matches documents containing 'tree' but not 'cat'. Search Titles Only -- Will only search document <title> text. Match All Words -- Makes 'AND' the default search. ie. Find docs containing all words. Uncheck to make 'OR' the default. ie. Find docs containing either word entered. Match Whole Words -- Check for exact match. When checked, 'template' will not match 'templates'. Show Results in Tree -- When checked, search results are displayed by highlighting matching tree items. When unchecked search results are listed as usual. To close the search results list and return to TOC view either - Hit Esc, or a toc link like 'sync toc' or '<<', '>>'. get link -- Get the absolute address of the current page. Hit ENTER to change the browser page address (for bookmarking etc). sync toc -- Selects the TOC item (left side) that matches the current page (right site). << >> -- Select prev/next TOC item. Alternatively use the up and down arrows then hit Enter to display the page.